This story will be about the tree. But it’s not an usual tree, as you could think! 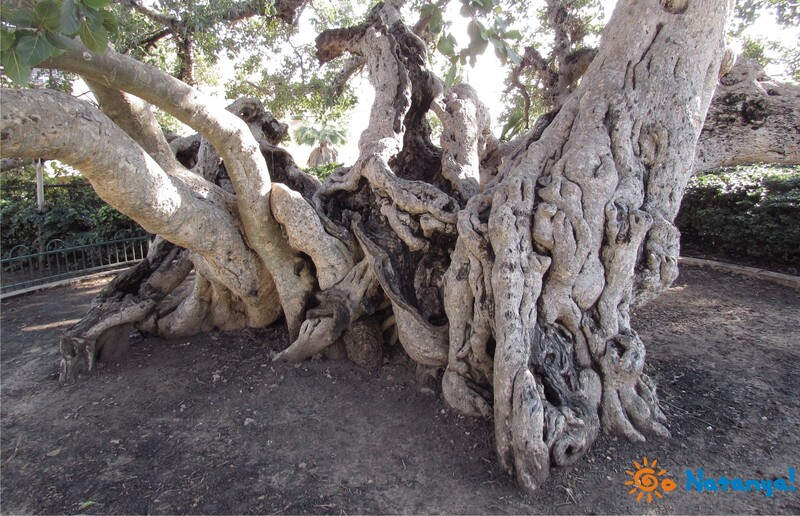 This story will be about the very old, may be one of the most ancient trees in Israel. And the name of this tree is the Sycamore. Let’s see, what we know about sycamores. This name is known from the ancient times. For example, in the Bible, this word meets many times, in the different contexts. The name “sycamore” from the ancient times is surrounded by mysteries. In many cultures and religions, there are too many mentions about this tree. Sycamores are very big trees. They have big crowns, which make a shadow in sunny days. Sometimes, sycamore is called “donkey fig”. That’s because of its fruit: small sweet berries. Birds, bats, donkeys and camels like them, but for the man, they are not tasty enough. 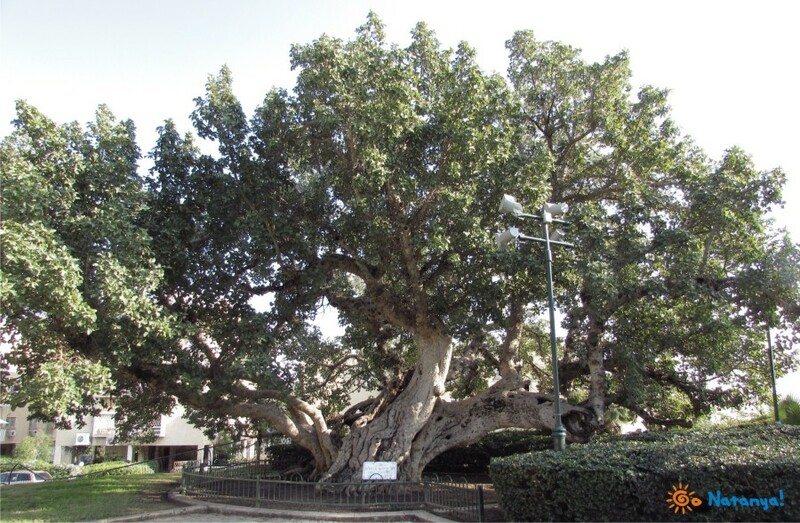 The sycamore, that grows in Netanya, is the one of the biggest and most old trees in Israel. The trunk of sycamore in Netanya is about eight meters around. During the life of the tree, it broke, cracked, and grow again. Now it looks a bit strange. When you look at the tree, from some angles, it looks like a wooden octopus, or like a decoration from scary movie. But, in despite of its age and appearance, the tree still fruits. A ground, around the tree, is full of fallen berries. As many researchers say, the age of sycamore in Netnya, is from six hundred till one thousand and five hundred years. Why the gap is so big? The real age of a tree will be known only after sawing it. So how researches counted up its age? The answer is very simple. This tree is well known from the Middle Ages. The mention about it, is found in the Chronicles of XIV-XV ages. So the age of the tree could not be less, than six hundred years. But the situation with the highest limit of the age is much more complecated, but it’s much more interesting. If you look around sycamore, you will see, that there are no tree, older than 50 years. Why is it so? Why does this tree live longer its neighbors? This is the most interesting part of our story, where we’ll tell you about the unique legend of this ancient tree. For the understanding how deep this legend is, we must return to the VII century. In those times, the center of civilization had moved to the Near East, where was the great confrontation between two super-Empires: Byzantium and Arab Caliphate. Caliphate which was a very “young” state, appeared at the beginning of the VII-th century on the Arabian Peninsula. During 30 years after appearing, it became the greatest state of a Region. At the start of its history, Caliphate had no power enemies. All its neighbors were little arabian tribes, that could not make a union against growing islamic caliphate. That’s why Muhammad, the Leader and Founder of a new state, had no problems with a conquest at the beginning. But soon after Muhammad’s death, new rulers of a Caliphate, decided to attack not only arabian territories, but other states around Arabian Peninsula too. There was only one problem: almost all of this states were under the vassalage from Byzantine Empire and from Iran of Sassanid (Persian Empire). These two Empires were the Greatest from Ancient times, and Byzantium was the center of Early Medieval civilization. It was a cultural, financial and religious capital of the whole world in those times. Of course, both sides of the potential conflict knew, that the great war, was just a question of a time, and soon this war began. The territory of Israel was exactly in the center of this war between arabs and greeks. Holy Land saw armies of both sides, marching throught it from North to South and back. It continued untill appearance of the man, whose name was Khalid ibn-al Walid. Surely, this man was on the arabian side. As historical books tell us, al-Walid was a general, whonever admitted a defending war. His doctrine was “attack, attack, and attack once again”. The most of his victories al-Walid won “before the battle”. The armies of enemies became absolutely demoralized, when flags of “Sayf Allah” rose above the arabian orders. Armies of Byzantium and Persians left battlefields in the heart of a battle and ran away. And this man appeared here in the Holy Land from the South, on his way to Syria. The most unusual fact in the biography of al-Walid is, he was accompanied by his mother in all his conquests . This man, who was a nightmare for many armies and generals, was a very good son, who adored his mother. His mother was a very old brave woman, who believed in her son, and remained in the command center of al-Walid’s army, even during the battle. It was very risky, especially in the Middle Ages. If al-Walid had lost his battle, the price of it would be too high. He would lost not only his honor, but his mother too. That’s why his rage in battles was without borders. He protected not only his command center, but the biggest treasure in his life. As legend says, once, when al-Walid’s army was in a region of present Netanya, his mother was very tired, and she asked her son to stop a march for a rest. She laid in the shaddow of a big tree and fall asleep. But this dream was her the last, she died. Regretful al-Walid buried her under this tree with great honors and forbade to touch the tree ever. This tree was old sycamore in Netanya. This legend walked through centuries. It was so survivable, that Turks, who came here in XIV century built a village, called it “Umm-Khaled”, that means “Mother of Khalid”! It is really unusually, because as a rule all new villages in all times people prefer to call in the honor of leaders or national heroes. Just imagine, that the story about great general and his mother, was still actually after seven hundred years! The fear, awe and respect for the name of al-Walid lived over 1500 years. The tree upon the grave of his mother, was not cut down neither by Arabs, nor crusaders, who built a castle not far from a sycamore, nor Turks, who built “Umm-Khaled”, nor Napoleon’s army, who was here in XIX century, nor British, who cut down all forest around to build a railway. Though needed wood. But nobody touched the ancient tree, standing upon a grave of al-Walid’s mother. Certanly, now sycamore stands on its place not because of the scare of Khalid’s name. Today, it’s a monument, a witness of ancient story of a Region. In its shadow millions of people had a rest. The most famous of them was a great French Emperor Napoleon who was here twice. For the first time, he rested here after the great victory near Jaffa. He laid under the tree in a perfect mood and thought, that his conquest of Near East would be easy. After his defeat in battle near Acra, where he lost all his army, he was here for the second time. He was so angry and disappointed that he ordered to destroy village “Umm-Khaled. Sitting under the tree, he watched, how village was burning. Many things were changed: dusty road became a new highway, little village became a part of a city, the railway was built. In the shaddow of the tree not so many people have a rest now. They find comfort in a new buildings with conditioners. But the tree is still watching for us, like an old man, who knows, that everything is vanity. If you want to find this tree, you should find “The garden of Sycamore” which is situated on the backyard of “Culture Hall” of Netanya on the street Derech Raziel 6.